Advances in the treatment of the human immunodeficiency virus (HIV) have dramatically improved survival rates over the past 10 years, but HIV-associated neurocognitive disorders (HAND) remain highly prevalent and continue to represent a significant public health problem. This review provides an update on the nature, extent, and diagnosis of HAND. Particular emphasis is placed on critically evaluating research within the realm of cognitive neuropsychology that aims to elucidate the component processes of HAND across the domains of executive functions, motor skills, speeded information processing, episodic memory, attention/working memory, language, and visuoperception. In addition to clarifying the cognitive mechanisms of HAND (e.g., impaired cognitive control), the cognitive neuropsychology approach may enhance the ecological validity of neuroAIDS research and inform the development of much needed novel, targeted cognitive and behavioral therapies. The research described was supported by MH73419 and MH62512 from the National Institutes of Health. The views expressed in this article are those of the authors and do not reflect the official policy or position of the Department of the Navy, Department of Defense, nor the United States Government. The Centers for Disease Control and Prevention (CDC 2006) estimate that over 1 million individuals in the United States (U.S.) are infected with the human immunodeficiency virus (HIV), which affects nearly 33 million people world-wide (United Nations 2007). In the U.S. and other developed countries, survival rates associated with HIV infection have improved dramatically since the introduction in 1996 of combination antiretroviral therapies (cART), which are capable of reducing viral burden, raising cluster of differentiation 4 (CD4) cell counts, reducing opportunistic infections, and improving health-related quality of life (e.g., Powderly 2002). Despite these remarkable improvements in immune health outcomes, HIV-associated neurocognitive disorders (HAND) remain a significant public health concern. Although neurocognitive impairments are not universal among HIV infected persons, clinically obvious signs and symptoms of at least mild neurologic disease are found in approximately 30% of persons with asymptomatic HIV infection and about 50% of individuals with the acquired immunodeficiency syndrome (AIDS) (Heaton et al. 1995). While the incidence of the most severe form of HAND, HIV-associated dementia (HAD), has declined in the era of cART (e.g., Sacktor et al. 2001), the incidence and prevalence of milder forms of HAND have been relatively stable (McArthur 2004) and may have even increased in individuals who are not immunosuppressed (e.g., Grant et al. 2005). The intention of this review is to provide an update on the nature, extent, and cognitive mechanisms of HAND. We will touch briefly on issues of neurobiology, cART, comorbidities, and everyday functioning throughout this review. The reader is referred to the companion articles within this special issue for in-depth discussions of these important topics. Although numerous excellent review articles and meta-analyses have been published on the neurocognitive aspects of HIV (e.g., Reger et al. 2002; Grant 2008), a unique aspect of this review is the focus on the cognitive neuropsychology of HAND. By cognitive neuropsychology, we mean the use of theoretical models from cognitive psychology and the cognitive neurosciences to test hypotheses regarding the component processes, mechanisms, and associated underlying neural systems of HAND. The first National Institute of Mental Health (NIMH) workgroup on neuroAIDS endorsed this approach, noting that: “new experimental paradigms borrowed from cognitive psychology should be represented in the (neurocognitive) battery” (Butters et al. 1990). Although the early years of neuroAIDS research were appropriately focused on the use of traditional neurocognitive approaches to examine the incidence, prevalence, and general profile of HAND, the past 15 years have seen an influx of studies applying the cognitive neuropsychology approach. In addition to clarifying the cognitive mechanisms of HAND (and neurotropic viruses more generally), the cognitive neuropsychology approach may improve the predictive, discriminant, and ecological validity of neuropsychology as pertains to the clinical assessment and remediation of HAND (Poreh 2000). Very early in the AIDS epidemic, clinicians noticed prominent “organic” mental and neurological symptoms in a subset of patients with advanced disease (e.g., Perry and Jacobsen 1986; Snider et al. 1983), suggesting that the underlying pathogen (not known to be HIV at the time) likely affected the central nervous system (CNS). Snider and colleagues (1983) are credited with the first systematic description of the CNS complications of AIDS in a case series of 50 patients, a proportion of whom exhibited possible AIDS-related dementia. In these early years, patients with cognitive impairment were often severely demented, which was viewed as a harbinger of imminent mortality. Although these initial studies of the AIDS dementia complex (ADC) described the clinical onset of symptoms as insidious in most cases, many dementia cases had abrupt accelerations sparked by opportunistic infections (or pulmonary infections with hypoxia), thus obscuring conclusions regarding a possible direct relationship between HIV and cognitive deficits (e.g., Navia et al. 1986). The existence of neurocognitive impairment directly attributable to HIV, especially in the medically asymptomatic phase of disease, was somewhat controversial until 1987, when Grant et al. published the first comprehensive study of HIV-associated neurocognitive deficits. Findings from this study provided strong evidence of objective neurocognitive impairment across all stages of HIV disease (i.e., medically asymptomatic, symptomatic, and AIDS) and in multiple ability areas, including executive functions, episodic memory, and information processing speed. Soon thereafter, the AIDS Task Force of the American Academy of Neurology (AAN) (1991) convened to outline diagnostic guidelines for classifying the neurologic complications of HIV infection. At that time, two levels of disturbance were proposed: 1) HIV-associated dementia (HAD) with motor, behavioral/psychosocial, or combined features; and 2) minor cognitive motor disorder (MCMD). To meet criteria for a diagnosis of HAD a patient needed to demonstrate an acquired deficit in at least two neurocognitive domains that caused impairment in work or activities of daily living (ADLs), as well as evidence of an abnormality in motor abilities or specified neuropsychiatric or psychosocial functions (e.g., motivation, lability, and social behavior). MCMD described a less severe presentation of HIV-associated neurocognitive impairment that did not meet criteria for HAD, but was marked by impairment in at least two neurocognitive or behavioral areas that produced a decline in ADLs. In 1995, Grant and Atkinson expanded the AAN system to include an additional diagnosis of “subsyndromic neurocognitive impairment” to characterize patients who demonstrated mild neurocognitive deficits that do not noticeably interfere with ADLs, a diagnosis which became increasingly more recognized in neuroAIDS research laboratories and clinics. While the modified AAN criteria (Grant and Atkinson 1995) were reasonably accurate in predicting presence of HIV-associated neuropathologies (e.g., Cherner et al. 2002), researchers and clinicians alike have since recognized the need to update and further structure the diagnostic criteria for HAND, especially in light of the changing epidemiology of HIV infection (Antinori et al. 2007). First, the applicability of the old criteria is now limited in the present age of cART. Prior to the advent of cART, a diagnosis of HAD was associated strongly with low T-cell counts, high viral loads, and opportunistic infections. With cART moderating viral severity, persons with HIV typically live longer with milder medical symptoms. Although cART initiation has been linked to cognitive improvement and decreased incidence of HAND (e.g., Brodt et al. 1997; Sacktor et al. 1999; 2001), yearly incidence rates are still 10–25%, suggesting that a variety of factors (e.g., immunological, genetic, psychosocial) may also play an important role in determining cognitive impairment (Robertson et al. 2007). Secondly, the modified AAN criteria (Grant and Atkinson 1995) did not provide specific guidelines for the assessment and determination of neurocognitive impairment. Considering the increased prevalence of HIV infection since the early diagnostic criteria and corresponding incident growth of cognitive sequelae, standardization became increasingly necessary in order to better address risk characteristics and treatment possibilities. Finally, guidelines regarding possible neurocognitive impairment due to comorbid conditions with CNS effects (e.g., substance use disorders) were necessarily vague in the previous diagnostic scheme, which diminished interrater reliability of HAND (Woods et al. 2004b). This caveat is particularly important in the era of cART as those infected with HIV began living longer with a host of CNS risk factors, including comorbid infectious diseases (e.g., hepatitis C virus), substance use disorders (e.g., methamphetamine dependence), and medical conditions associated with cART treatment (e.g., hyperlipidemia). To address the concerns of definitions and causes of neurocognitive impairment in HIV-infected individuals, the nosology of HAND was recently revisited and subsequently amended using recommendations from an NIH working group (Antinori et al. 2007). As displayed in Fig. 1, the redefined criteria allow for three possible research diagnoses: 1) asymptomatic neurocognitive impairment (ANI); 2) HIV-associated mild neurocognitive disorder (MND); and 3) HAD. The diagnosis of HAND must be determined by assessing at least five areas of neurocognitive functioning known to be affected by HIV infection (e.g., executive functions, episodic memory, speed of information processing, motor skills, attention/working memory, language, and sensoriperception). Ideally, these domains would be evaluated using a performance-based neurocognitive battery and interpreted using demographically-appropriate normative data, although the criteria allow for use of mental status exams, such as the HIV Dementia Scale (Morgan et al. 2008; Power et al. 1995) in resource-limited settings. If observed, neurocognitive impairment cannot be assigned a HAND diagnosis if it is solely attributed to a comorbid condition (e.g., psychosis or substance use) or delirium. Due to the high prevalence of CNS comorbidities in HIV populations, the updated criteria specify guidelines for dealing with incidental (e.g., an individual with remote history of sporadic methamphetamine use that is unlikely to have residual cognitive effects), contributing (e.g., an individual with methamphetamine dependence within one year, but who is exhibiting clear signs of HIV-related cognitive decline), and confounding (e.g., an individual who is acutely intoxicated on methamphetamine) conditions. As a diagnosis of HAND often rests on determining the presence (or absence) of declines in everyday functioning, it is important to consider the many intricacies and complications involved in assessing functional impairment. Currently, there are no widely agreed-upon clinical measures of everyday functioning (see Morgan and Heaton 2009). Performance-based assessments of everyday functioning are sometimes used in research settings, but the lack of normative data coupled with lengthy administration protocols make it unlikely that the currently available measures would be widely used in a clinic setting (Moore et al. 2007). More commonly, assessments of everyday functioning rely on self-report, using questionnaires such as Lawton & Brody’s modified Activities of Daily Living scale (Heaton et al. 2004) and the Patient’s Assessment of Own Functioning (PAOFI; Chelune et al. 1986). In some cases, proxy (e.g., significant others and caregivers) reports may complement patient report, particularly in cases of cognitive impairment and poor insight. Similarly, self-reported functional abilities are oftentimes confounded by psychiatric (e.g., over-reporting due to depressive symptoms) or socioeconomic (e.g., under-reporting to retain occupational responsibilities) factors, which must be carefully considered in assessing self-report validity. Considering the growing literature on mild neurocognitive impairment in the absence of declines in everyday functioning, asymptomatic neurocognitive impairment (ANI) was added as a diagnosis consistent with earlier references to subsyndromic neurocognitive impairment (i.e., Grant and Atkinson 1995). This previously unclassified contingent is estimated to represent the majority of cases of HAND (i.e., over 50% of diagnosed cases) and 21–30% of the asymptomatic HIV-infected individuals (Robertson et al. 2007). The clinical significance of such “subsyndromic” impairment is less well-established, although it has been associated with neuropathologic abnormalities (Masliah et al. 1997; Cherner et al. 2007) and an increased risk of early mortality (Ellis et al. 1997). Detecting patients with mild, yet demonstrable, neurocognitive impairment (i.e., > 1 SD below the mean of demographically-adjusted normative scores in at least two cognitive domains) may assist in the effort to pre-identify those at risk for more significant cognitive as well as functional decline, before cognitive deficits contribute to a decline in everyday functioning with serious medical consequences (e.g., medication nonadherence). In principle, as effective treatments for neurologic complications are developed, intervention at this earliest stage of HAND might stand the best chance to effect remission, or at least, prevent progression. Formerly referred to as MCMD, mild neurocognitive disorder (MND) requires mild-to-moderate neurocognitive impairment (i.e., > 1 SD below the mean of demographically-adjusted normative scores) in at least two cognitive domains in addition to mild everyday functioning impairment. Approximately 30–50% of persons with a HAND diagnosis experience some degree of functional impairment and it is estimated that 20–40% of HAND diagnoses are of MND, which comprises 5–20% of the HIV population overall. The prevalence of MND is estimated between 5% to 14% in individuals with early symptoms and approximately 25% of those with AIDS (Goodkin et al. 2001; Grant and Atkinson 1999). Mild functional impairment can be classified as meeting at least two of the following criteria: 1) self- or proxy-report of declines in ≥ 2 instrumental activities of daily living (IADLs; e.g., financial management); 2) unemployment or a significant reduction in job responsibilities secondary to reduced cognitive abilities; 3) decline in vocational functioning (e.g., increased errors, decreased productivity, or greater effort is required to achieve prior levels of productivity); 4) self- or proxy-report of increased problems in ≥ 2 cognitive ability areas in day-to-day life (this criterion cannot be used if based only on the self-report of an individual with current depression, since depression may bias self-report); or 5) scores > 1 SD below the mean on a performance-based laboratory measure of everyday functioning (e.g., medication management). The most severe form of HAND, HIV-associated dementia (HAD) is marked by at least moderate-to-severe cognitive impairment (i.e., ≥ 2 SDs below demographically-adjusted normative means) in at least two cognitive domains along with marked ADL declines that are not fully attributable to comorbidities or delirium. Additionally, HAD represents the most severe form of HAND in terms of its functional impact, which requires two or more of the following: 1) unemployment due to cognitive impairment; 2) self- or proxy-report of dependence in > 2 IADLs related to cognitive problems; 3) self- or proxy-report of declines in ≥ 4 cognitive ability areas in day-to-day life (NB. As with a diagnosis of MND, this criterion is not applicable if based exclusively on the self-report of an individual with current depression); 4) performance that is > 2 SD below the mean on a performance-based laboratory measure of everyday functioning (or > 1 SD below the mean on two functional tests). Reports from the early 1990’s placed an extremely wide range, 6–30%, on the prevalence of HAD among persons with AIDS (Day et al. 1992; McArthur et al. 1993; Maj et al. 1994). After the advent of cART in the late 1990’s, estimates appeared to shift downward with approximately 4% to 7% of persons with AIDS (Grant and Atkinson 1999), with more recent appraisals suggesting that as few as 1% to 2% of HIV+ persons meet criteria for HAD (Grant et al. 2005). Unlike other neurodegenerative disorders, such as Alzheimer’s and Huntington’s diseases, HAND is not invariably progressive and is therefore not an immutable diagnosis. Indeed, there is tremendous variability in the course of HAND, with evidence now showing that individuals may display considerable recovery of cognitive functions (e.g., with effective cART), incident worsening of HAND (e.g., with advancing disease), static neurocognitive impairment, sustained normality (e.g., Cole et al. 2007), or a fluctuating course. Robertson et al. (2007) showed that, of HIV-infected persons who were unimpaired at their baseline visit, 21% experienced incident neurocognitive impairment over a relatively brief follow-up period. However, most persons with incident HAND are initially classified with mild impairment; that is, it is rare for persons in the current era of cART to transition from unimpaired to moderately or severely impaired in a year (e.g., McArthur 2004). A finding that is becoming increasingly apparent with regard to the course of HAND is that a significant proportion of individuals will improve neurocognitively. In the Robertson et al. (2007) study, of those persons with HAND at baseline, 56% remained impaired whereas 44% no longer met criteria for impairment. Furthermore, the likelihood of transitioning from milder neurocognitive impairment to unimpaired (21%) appears to be as likely as transitioning from unimpaired to mild neurocognitive impairment (23%) (McArthur 2004). Nevertheless, it is difficult to interpret the data on incident HAND, especially considering the complications of practice effects (e.g., Woods et al. 2005b) that, if uncorrected, may inflate the rates of observed improvement (and perhaps also dampen the rates of incident impairment). The incidence data are also confounded by the necessary use of cutpoints for the classification of neurocognitive impairment (Carey et al. 2004), which are highly susceptible to mis-classification errors secondary to normal test-retest variability. A review of HIV-infected individuals at autopsy showed that the brain is the second most frequently infected organ after the lungs (Masliah et al. 2000). HIV often targets the CNS because neural cells and microglia resident in the brain can express chemokine receptors (e.g., CXCR4) receptors that are necessary for HIV entry into cells (see Hult et al. 2008 for a review). Considerable evidence suggests that HIV preferentially disrupts the fronto-striato-thalamo-cortical loops. However, unlike some other neurodegenerative disorders where the pathology is endogenous and may have a genuine affinity for a specific brain region (e.g., the substantia nigra in the initial stages of Parkinson’s disease), HIV also affects the structure and function of other white matter tracts and neural systems, including the temporal (e.g., hippocampus) and parietal cortices (e.g., Thompson et al. 2005). One reason for the lack of regional specificity is that the virus infiltrates the CNS by crossing the blood-brain barrier (BBB) within monocyte derived macrophages and/or monocytes via a “Trojan Horse” mechanism (Hult et al. 2008). Although HIV does not necessarily infect neurons, once across the BBB, the virus can produce synaptodendritic injury through a host of different direct (e.g., viral proteins) and indirect (e.g., neuroinflammatory) mechanisms (see Hult et al. 2008), which can result in damage to a variety of neural systems. Some have hypothesized that the basal ganglia may be affected earlier in the illness, with neocortical regions affected only with more advanced disease. However, clinico-pathologic studies of HIV+ persons with less advanced disease and an absence of opportunistic infections are often difficult to conduct given that these very factors typically represent a primary cause of mortality (Moore et al. 2006). Further complicating matters is that the neuropathogenesis of HIV may be changing as the acute and more rapidly developing deleterious indirect cascade of events caused by HIV infection noted in the early years of the pandemic may be giving way to a chronic mild inflammatory state made possible by the effectiveness of cART in permitting long term survival (Foley et al. 2008). In fact, it has been noted that whereas classical HIV-associated brain pathology (i.e., evidence of HIV encephalitis, such as microglial nodules) may be less prevalent in the post-cART era (see Ellis et al. this issue), other evidence of brain injury remains prevalent, including loss of synapses and dendrites, and, in some cases, focal or diffuse inflammatory change in the white matter, and microvascular pathology. Ongoing neural injury may be driven by chronic inflammation, occasioned by some combination of low-level viral replication in the CNS or abnormal immune activation triggered by HIV, may persist despite good virologic control. Further neural injury may be amplified by cofactors such as drugs of abuse, co-infections (e.g., hepatitis C), and aging. With these caveats in mind, much attention has been given to the examination of the structure and function of subcortical regions among HIV-infected persons, most notably the basal ganglia. These data generally suggest that, although HIV may affect multiple brain regions, the neurotoxic effects of the virus are most prominent in the basal ganglia, as well as the frontal neocortex and the white matter tracts connecting these regions. For example, subcortical regions (e.g., caudate and putamen) may have higher viral loads than cortical regions among individuals with HAD (Fujimura et al. 1997; Wiley et al. 1998). Morphometric analysis, using magnetic resonance imaging (MRI), has shown decreased volume of the basal ganglia in advanced HIV disease (Jernigan et al. 1993), including HAD (Aylward et al. 1993). Masliah et al. (1996) noted ‘extensive loss’ of microtubule-associated protein 2 (MAP2) -immunoreactive neurons and dendrites in the basal ganglia of individuals with HIV encephalitis (HIVE). Additional correlative imaging studies have shown a relationship between caudate volume loss and deficits in motor skills, information processing speed, verbal fluency, and complex attention (Kieburtz et al. 1996). More recent studies have revealed associations between microstructural abnormalities in the basal ganglia (i.e., caudate and putamen) and HIV-associated cognitive impairment (e.g., episodic memory) (Ragin et al. 2005). Proton magnetic resonance spectroscopy (MRS) studies have also confirmed greater disruption in the basal ganglia of cognitively impaired HIV+ persons (Paul et al. 2007). There is also significant evidence suggesting that HIV affects the frontal cortex. Frontal dysfunction has been interpreted as a consequence of late stage HIV disease and may be secondary to basal ganglia pathology (Rottenberg et al. 1987). In the presence of HIVE, Masliah et al. (1995b) found that neurons in neocortex were significantly reduced. Subsequent clinico-pathologic studies have shown associations between cortical neurodegeneration and HIV-associated global neurocognitive impairment (Everall et al. 1999; Masliah et al., 1997). For example, Moore et al. (2006) confirmed a univariate association between frontal neurodegeneration and neurocognitive impairment. However, when additional brain regions were examined using multivariate statistical approaches, synaptodendritic loss in the putamen and hippocampus were the sole independent predictors of neurocognitive deficits, with a suggestion that cortical and subcortical pathologies might evolve along separate trajectories in some individuals. Indeed, despite the absence of traditional cognitive markers of hippocampal neurodegeneration in HIV (i.e., rapid forgetting), there is considerable neuropathological evidence that hippocampal neurons are affected in advanced HIV disease (Kruman et al. 1998; Masliah et al. 1992). A similar story emerges when one examines the possible contribution of parietal pathology to neurocognitive impairment in HIV (e.g., Thompson et al. 2005). Therefore, it may be that the expression of HIV-associated cognitive deficits is driven by dysregulation of broader neural networks that depend on the integrity of the frontostriatal loops (e.g., frontotemporal and frontoparietal systems), rather than by isolated frontal systems pathologies alone (e.g., Castelo et al. 2006). In fact, perhaps the most consistent finding among the neuroimaging and neuropathological studies of HIV+ persons in the post-cART era is the involvement of cerebral white matter, which may disrupt the functional connectivity of the basal ganglia and neocortex. HIV-associated white matter abnormalities are diffuse, but often include frontal white matter and subcortical pathways (e.g., internal capsule), and may reflect synaptodendritic injury severity (Archibald et al. 2004). Moreover, decreased n-acetylaspartate (NAA, a marker of neuroaxonal injury) is commonly observed in the white matter of the basal ganglia and frontal cortex (e.g., Ernst and Chang 2004; Paul et al. 2008) and has been related to neurocognitive impairment, including deficits in motor skills (Paul et al. 2007). Diffusion tensor imaging (DTI) studies have revealed microstructural abnormalities in the white matter (i.e., increased mean diffusivity and reduced fractional anisotropy), which are more prominent in persons with advanced disease (Filippi et al. 2001; Pfefferbaum et al. 2007) and HAND (e.g., Gongvatana et al. 2007a). The diffuse nature of HIV-associated neuropathologies creates notable challenges in directly translating such non-specific neurobiological mechanisms of HIV into testable hypotheses for studies of cognitive neuropsychology, which is a method that relies heavily on the dissociability of neural systems. Accordingly, HIV is limited as a disease model for developing conceptual hypotheses regarding the role(s) of specific brain systems in cognition, as might be better accomplished in focal lesion samples or diseases in which the pathology is more restricted in the early phases of the illness (e.g., Huntington’s disease). Nevertheless, such models are still applicable to the study of neuroAIDS and provide useful conceptual frameworks for elucidating the cognitive mechanisms of HAND, which may in turn inform neurobiological investigations. In point of fact, early observations that the neurobehavioral profile of HAND was most consistent with that of other ‘subcortical’ disorders (e.g., Huntington’s disease), with deficits especially in the areas of motor skills, processing speed, and executive functions (e.g., Grant et al. 1987; Price et al. 1988), helped to guide subsequent neuroimaging and neuropathological studies of HIV. Moreover, HIV affords the opportunity to explore the possible unique and combined roles of specific CNS biomarkers (e.g., markers of neuronal injury, inflammation, astrocytosis, and neuroprotective factors in plasma and cerebrospinal fluid [CSF]) in the expression of HAND, which may also fuel the next generation of hypothesis-driven studies within cognitive neuropsychology. Severe movement abnormalities, such as chorea, myoclonus, dyskinesia, and dystonia, are not frequently observed in association with HIV infection, but can occasionally emerge in individuals with HAD (e.g., Mirsattari et al. 1999) or CNS opportunistic infections that affect the nigrostriatal dopaminergic system (e.g., Tse et al. 2004). Clinically observable extrapyramidal signs can be nevertheless apparent in HIV, particularly in persons with advanced disease. Valcour et al. (2008) found that older adults with HIV were disproportionately impaired on the motor scale of the Unified Parkinson’s Disease Rating Scale, most notably on measures of bradykinesia, hypomimia, action/postural tremor, and hand agility. More subtle motor abnormalities are also oftentimes evident on electrophysiological measurements of rapid alternating movements and finger contraction, which have been touted as particularly sensitive markers of HAND (e.g., Arendt et al. 1990). It is widely held that bradykinesia (i.e., slowed movement) and bradyphrenia (i.e., slowed information processing) are the most prominent features of neuroAIDS. As noted above, motor slowing was a required feature of HAD in the early diagnostic formulations (AAN 1991). In fact, some authors have argued that bradykinesia and bradyphrenia are the cardinal symptoms of HAND (Hardy and Hinkin 2002) and may even underlie deficits observed in neurocognitive domains that are not expressly speeded (e.g., Becker and Salthouse 1999). HIV-associated motor slowing is often seen in gait velocity (e.g., Robertson et al. 2006), finger tapping (e.g., Heaton et al. 1995), and manual dexterity (e.g., grooved pegboard; Carey et al. 2004). Slowed information processing speed is present on tasks with (e.g., Trail-making) and without (e.g., Stroop Color-Word) motor demands. HIV-associated cognitive and motor slowing deficits are oftentimes exacerbated when controlled processing demands are increased, such as under conditions of divided attention (e.g., Martin et al. 1999). Despite the prominence of basic and complex motor deficits in HIV, research on its component process and underlying cognitive mechanisms is relatively scant. Indeed, psychomotor speed is an ill-defined cognitive construct as deficits may emerge from a variety of CNS insults, and most of the available tests are multifactorial. Even the term ‘psychomotor speed’ implies a potpourri of related, but separable cognitive constructs typically poorly articulated (e.g., reaction time studies often use ‘time’ as an indicator of varying demands of test conditions, such as divided attention, than speed per se). Furthermore, impaired performance on traditional tests of information processing speed could arise from a variety of deficits, including attention (e.g., sustained or divided attention), visuoperception, working memory, praxis, and basic motor skills. To this end, Sassoon et al. (2007) found that HIV-associated impairment on the Digit Symbol test may emerge secondary to basic motor slowing, even after considering the effects of executive functions, visuoconstruction, and memory. More hypothesis-driven research on the underlying component processes of HIV-associated motor and information processing slowing is needed, particularly considering research showing that such deficits are reliable predictors of a variety of daily functioning outcomes, including adherence (Waldrop-Valverde et al. 2006), automobile driving (Marcotte et al. 1999), and health-related quality of life (e.g., Parsons et al. 2006). Episodic memory impairment is highly prevalent in HIV, with most estimates ranging from 40 to 60% (e.g., Heaton et al. 1995; Rippeth et al. 2004). HIV-associated deficits in episodic memory are readily observed on a variety of verbal (e.g., word lists and passages) and visual (e.g., simple and complex designs) tasks. Along with psychomotor slowing, deficits in episodic memory are arguably one of the most sensitive indicators of HAND (e.g., Carey et al. 2004). In general, the level of impairment tends to be in the mild-to-moderate range but may increase to moderate-to-severe in patients with advanced HIV disease (Reger et al. 2002), especially HAD (e.g., Scott et al. 2006). At the group level, the pattern of HIV-associated episodic memory deficits is most consistent with a mixed encoding and retrieval profile (Delis et al. 2000), although there is considerable variability between individuals (Murji et al. 2003). Approximately 30–40% of HIV-infected patients demonstrate this profile (e.g., Becker et al. 1995; Delis et al. 1995), which is characterized by impaired immediate and delayed free recall in the setting of relatively better recognition performance (Woods et al. 2005c). By contrast, only a small proportion of HIV-infected persons display evidence of rapid forgetting, which is sometimes evident in persons with HAD, perhaps secondary to shallow encoding as indicated by elevated recency effects (Scott et al. 2006). Although mild deficits may be evident on recognition testing (e.g., Delis et al. 1995), this impairment is thought to reflect inefficient higher-level encoding, including source memory (Morgan et al. 2009). Numerous studies show that HIV-associated deficits in free recall of verbal material are marked by diminished use of strategic organizational strategies, such as semantic clustering (e.g., Peavy et al. 1994), which may increase in magnitude with the severity of HAND (Gongvatana et al. 2007b). At the level of neural systems, this pattern of episodic memory impairment is most consistent with a frontostriatal loop pathogenesis (Castelo et al. 2006). One aspect of episodic memory that is highly dependent on frontal systems (e.g., Brodmann’s area 10) is prospective memory, which entails one’s ability to successfully execute a future intention (or more simply, ‘remember to remember’). Prospective memory is a multifaceted construct involving the formation, maintenance, retrieval, and execution of a future intention, vis-à-vis ongoing mental activities that prevent continuous rehearsal of that intention. HIV infection is associated with frequent prospective memory complaints, particularly in aspects of daily functioning that require self-initiated cue monitoring and retrieval (Woods et al. 2007). Moreover, individuals infected with HIV demonstrate mild-to-moderate impairment on performance-based tests of prospective memory, including both time- (e.g., Martin et al. 2007) and event- (Carey et al. 2006) based tasks. The profile of HIV-associated prospective memory impairment is characterized by deficits in the strategic encoding (i.e., intention formation), monitoring, and retrieval of future intentions, as evidenced by elevated rates of omission and perseverative errors in the setting of normal recognition (Carey et al. 2006). Although prospective memory places demands on retrospective memory and executive functions (e.g., set switching), HIV-associated prospective memory impairment may nevertheless be singly dissociable at the neurobiological (e.g., Woods et al. 2006b), cognitive (e.g., Gupta et al., in press), and functional (e.g., Woods et al. 2008a, b) levels. Prospective memory is endemic to independent living, playing a critical role in such essential daily tasks as employment, household responsibilities (e.g., financial management), social functioning, and health care (e.g., medical compliance). As compared to global cognitive functioning, disease severity, and psychiatric comorbidity, Assessment of prospective memory deficits provides incremental ecological validity in predicting general IADL declines (Woods et al. 2008a) and medication mismanagement (Woods et al. 2008b) in HIV. For example, Woods et al. (2009) found that HIV-infected individuals with deficits in time-based prospective memory (i.e., loss of time errors) were nearly six times more likely to be non-adherent to their cART regimen than persons who performed within normal limits, even after the possible contributions of general cognitive impairment (e.g., retrospective memory) and psychiatric distress (e.g., depression) were considered. Findings such as these illustrate the potential benefits of applying novel theoretical models of cognition to improve our ability to predict and ultimately remediate everyday functioning deficits in persons living with HIV infection. Prospective memory complaints are only weakly correlated with performance-based deficits, suggesting that HIV-infected individuals may not accurately perceive their prospective memory functioning (Woods et al. 2007). Indeed, there is broad evidence of a ‘meta-memory’ deficit in HIV infection, which includes prospective memory as well as retrospective memory (e.g., Hinkin et al. 1996). HIV-associated meta-memory deficits are present in as many as 35–60% of the infected population (e.g., Hinkin et al. 1996; Rourke et al. 1999) and may be expressed as either over- or under-reporting one’s actual level of memory impairment. Over-reporting of HIV-associated memory problems is associated with affective distress, including depression (e.g., Rourke et al. 1999) and fatigue (e.g., Woods et al. 2007), where as under-reporting is more closely linked to executive dysfunction (Rourke et al. 1999). It is possible that such meta-memory deficits, and specifically under-estimation of actual impairment, may amplify the risk of functional impairment. For instance, an individual who underestimates their current level of prospective memory impairment may not choose to deploy necessary compensatory techniques in their daily life, including tailored mnemonic strategies, salient external reminders, and/or request assistance from others (Knight et al. 2005). Because the existing literature on HIV-associated meta-memory deficits has only evaluated the relationship between complaints and performance, further research is needed on the strength (and mediators) of the association between expected and actual memory performance. Other aspects of declarative memory (e.g., semantic, autobiographical, emotional) are quite poorly understood in HIV infection and, considering the prevalence and functional importance of HIV-associated episodic memory impairment, represent an important direction for future research. With regard to semantic memory, Sadek et al. (2004) reported that HAD was associated with mild deficits in memory for famous faces and public events, which in contrast to Alzheimer’s disease, did not show a temporal gradient and were generally comparable across time periods. Nevertheless, the HAD group displayed comparable remote memory impairment to a demographically comparable sample of patients with Huntington’s disease. Consistent with the above-described profile of HIV-associated episodic memory deficits, this pattern of impairment was hypothesized to stem from deficient retrieval from semantic memory stores secondary to frontostriatal circuit neurotoxicity. Surprisingly, very few studies have examined the effects of HIV on nondeclarative (i.e., implicit) memory, despite the considerable literature on procedural learning and priming in other diseases involving the basal ganglia, such as Parkinson’s disease (e.g., Harrington et al. 1990). In 1993, Martin and colleagues suggested that HAND may be associated with impaired motor skill learning, which Kalechstein et al. (1998) later showed may be exacerbated in individuals with comorbid depression. However, a larger and more comprehensive study of substance abusers by Gonzalez et al. (2008) revealed that, although HIV infection was associated with slowed complex motor skills (e.g., rotary pursuit), there was no evidence of impaired procedural learning per se. Although perceptual priming appears to be spared in HIV infection, HAND is nevertheless associated with deficits in semantic priming (e.g., Nielsen-Bohlman et al. 1997). Highlighting the potential ecological impact of nondeclarative memory impairment in HIV, Stacy et al. (2006) found that measures of “spontaneous cognition” were predictive of HIV transmission risk behaviors in a large sample of substance abusers. Consistent with other neurocognitive domains, the severity of attention/working memory impairment among individuals with HAND appears to be driven by HIV disease severity as well as complexity or “load” of the attention/working memory task. In early stages of HIV disease, basic attention/concentration skills appear relatively spared (Reger et al. 2002), but in later stage disease (e.g., CD4 < 200), mild-to-moderate deficits may appear in persons with HAND (Reger et al. 2002; Brew 2004). Recent functional neuroimaging studies suggest that the impairment in response to increased attentional load may be associated with increased frontoparietal activation (e.g., Chang et al. 2004). While the bulk of attention-based research is derived from traditional tests, such as digit span, digit vigilance (Heaton et al. 1995), and continuous performance tests (Levine et al. 2006), attention is ostensibly a multidimensional construct that requires further dissection. Most traditional measures of this ability are non-specific and have considerable overlap with other cognitive functions, perhaps most notably speed of information processing (e.g., Levine et al. 2008). As such, several previous studies have used the cognitive neuropsychology approach to clarify the specific mechanisms of attentional deficits in HIV, revealing impairment in the areas of divided attention (e.g., Hinkin et al. 2000), orienting (e.g., Martin et al. 1995), and response inhibition (e.g., Hinkin et al. 1999). A common theme of these studies is that HIV is associated with mild deficits in basic (i.e., automatic) attentional processes, which are amplified when controlled processing demands are increased (see also Hardy and Hinkin 2002). For example, Hinkin et al. (2000) eported disproportionately slower simple and choice reaction times in their HIV cohort under a dual (i.e., both auditory and visual choice paradigms) than a single task condition. 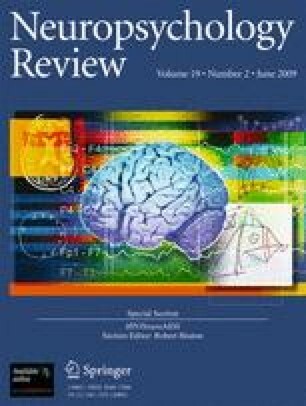 Nevertheless, as a result of the significant discrete component attention difficulties observed among HIV+ persons, authors have argued that a clearer definition of attention is necessary, one that more closely mirrors the cognitive psychology definition of attention and suggests that discrete component processes be examined (Levine et al. 2008). To this end, models such as that posed by Mirsky and Duncan (2001), which suggest a five component processes of attention (i.e., focus/execute, encode, shift, sustain, and stabilize), may be applicable to neuroAIDS. Levine and colleagues (2008) confirmed this five-factor solution in a cohort of HIV+ persons; however, the authors are quick to point out that the descriptors for the factors may not exactly map onto the component processes of attention (e.g., as mentioned above, the focus/execute component of attention may more accurately be a measure of processing speed). Nevertheless, investigations such as this may inform future hypothesis-driven experiments that are strongly grounded in cognitive theory and can carefully delineate the nature and mechanisms of attentional deficits associated with HIV infection. In addition to studies of basic attention, there have been several investigations into working memory (i.e., ability to create a memory representation for temporary processing and storage) abilities of HIV-infected persons that have shown significant difficulties with both visual and verbal working memory tasks (Bartok et al. 1997; Farinpour et al. 2000; Martin et al. 1995, 2001). From the perspective of Baddeley and Hitch’s (1974) model of working memory, several studies have hypothesized that HIV is primarily associated with impairment in the central executive, rather than the sensory slave systems (e.g., Hinkin et al. 2002b). The observed central executive deficits in working memory (e.g., increased load) have been linked to abnormal blood oxygenation level-dependent (BOLD) signals in frontoparietal networks, likely secondary to inflammatory activation of glia (Ernst et al. 2003). Nevertheless, research is not entirely consistent with regard to the primary involvement of the central executive in HIV-associated working memory impairment. For instance, it has been proposed that such deficits may be driven by difficulties in maintaining and storing representations, rather than central executive processes (Bartok et al. 1997; Law et al. 1994; York et al. 2001). Considering Baddeley’s (2003) revisions to this model, which now includes an episodic buffer that interacts with the central executive and long-term memory, prospective studies that employ rigorous experimental designs and methods are needed to shed light on the component processes of the widely-observed working memory deficit in HIV. Further clarification of the cognitive mechanisms of the HIV-associated working memory impairment is important because deficits in this area can affect higher-level cognitive abilities (e.g., decision-making; Martin et al. 2004) and are associated with everyday functioning difficulties. Specifically, Bassel and colleagues (2002) showed that attention/working memory deficits, along with depression, were among the strongest predictors of cognitive complaints among HIV+ persons. Furthermore, Levine and colleagues (2005, 2008) have shown attention (e.g., sustained attention) to be predictive of medication adherence. Visual attention abilities are also significantly associated with driving ability, particularly the number of driving accidents in the past year (Marcotte et al., 2004, 2006). Attention/working memory deficits (along with executive functioning impairments) were the strongest predictors of dependence in IADLs, as well as a summary score of performance-based measures of everyday functioning (Heaton et al. 2004). Studies that combine a detailed cognitive neuropsychology approach with comprehensive assessments of everyday functioning may be able to uncover even stronger mechanistic associations that may be targets for neurocognitive interventions and rehabilitation. According to Mega and Cummings (1994), executive functions include complex problem solving abilities, self-directed independent behaviors, and set shifting functions among other abilities. Executive functions are often assessed by measures of abstraction, problem solving, set shifting and reasoning. Intact executive functions are most notably dependant on the frontal cortex (especially the dorsolateral prefrontal system), as well as the basal ganglia and posterior parietal cortex (Stuss and Levine 2002). It is widely accepted that HIV is associated with executive dysfunction, especially in the later stages of disease (Reger et al. 2002). A recent study using a cluster analysis approach to uncovering neurocognitive impairments among HIV+ persons showed that executive functions impairments were a component of nearly all of the observed clusters suggesting that these impairments are central to most HIV neurocognitive impairment profiles (Dawes et al. 2008). Deficits in executive functions are strongly associated with impairments in everyday functioning (Heaton et al. 2004). There are numerous examples of studies that have used standard neurocognitive measures to assess executive functions among HIV+ persons. Deficits in abstraction and novel problem solving are commonly observed on the Halstead Category Test and the Wisconsin Card Sorting Test (e.g., Grant et al. 1987; Heaton et al. 1995). Assessments on the Stroop Color Word Test have reliably shown that HIV+ persons were significantly slower as compared to HIV- comparison participants, but the greatest difficulties are apparent on the interference condition suggesting deficient prepotent response inhibition abilities (Tozzi et al. 1999; Hinkin et al. 1999). Set shifting differences have been observed on the Wisconsin Card Sorting Test (Carter et al. 2003) and Trail Making Test Part B (Heaton et al. 1995; Reger et al. 2002). Deficits have also been observed on measures of cognitive (Bartok et al. 1997) and social planning (e.g., Benedict et al. 2000) among HIV+ persons. A more recent study suggests that HIV may be associated with impairment in semantic event sequencing, the neural substrates of which appear to involve the functional connectivity of the prefrontal cortex (i.e., dorsolateral and ventromedial regions) and basal ganglia (Melrose et al. 2008). Given that some HIV+ persons became HIV infected due to engagement in risky behaviors, there has been a particular interest in tests that assess risky decision making, which is hypothesized to assess frontal systems that may be particularly disrupted among HIV+ persons. Deficits among HIV+ individuals on the Iowa Gambling Test (IGT) have been observed in two studies (e.g., Hardy et al. 2006; Martin et al. 2004). Findings on the IGT suggest that HIV+ persons have a propensity to choose larger, immediate rewards over gradually-accumulated smaller rewards that result in increased longer-term gains overall. These response styles suggest more impulsivity among HIV+ persons, which may directly relate to risky decisions in daily life (e.g., failure to use a condom) (Martin et al. 2004). Furthermore, risky decision-making may be related to sensation seeking among HIV+ individuals and may represent a common pathophysiology (Gonzalez et al. 2005). As compared with other ability areas (e.g., memory and language), relatively fewer studies have examined the underlying component cognitive processes of executive dysfunction in HIV. This is surprising given the wealth of available conceptual models (see Stuss and Knight 2002), as well as the prevalence of executive deficits and their association with important functional outcomes, such as medication adherence (e.g., Hinkin et al. 2002a). Process analysis of clinical instruments, such as the Delis Kaplan Executive Functions System (D-KEFS), may be particularly useful in this regard. Furthermore, integration of novel conceptual aspects of executive and frontal functions, such as category learning, theory of mind, temporal perception and sequencing, and multitasking, may also shed light on the cognitive architecture of HIV infection. Considering the relative sparing of occipital and parietal cortices in neuroAIDS, it has been widely held that spatial cognition is largely unaffected in HIV infection. Large-scale early investigations seemingly supported this hypothesis, detecting no significant impairment in standard clinical tests of visuospatial functioning (e.g., Heaton et al. 1995). However, recent meta-analyses of these early data have shown mixed results (e.g., Reger et al. 2002; Cysique et al. 2006). Most of these early investigations used batteries that were limited in the breadth and depth of their assessment of spatial cognition (e.g., Rey-Osterrieth figure copy only), thereby raising the possibility that their null findings at the individual study level may reflect Type II error. Indeed, a few small early studies of HIV infection revealed evidence of possible mild deficits in spatial cognition, including visuoconstruction and visuospatial skills (Poutianinen et al. 1988). Since these early studies, subsequent investigations have examined select aspects of spatial cognition, defined as the ability to detect, understand, manipulate, and integrate visual stimuli in the context of its environment. A closer review across studies examining a wider range of spatial abilities indicates that subtle deficits are consistently present, even in the absence of basic visual dysfunction. Unsurprisingly, many of these studies noted that deficits occur in spatial abilities that rely more heavily on the integrity of fronto-striato-parietal networks. For example, egocentric spatial tasks (i.e., tasks that relate to the participant’s frame of reference, as opposed to that of an observer) were differentially more impaired in HIV+ individuals than seronegative participants, and also as compared to performance on extrapersonal tasks. HIV-associated deficits in global versus local visual processing (Martin et al. 1992), covert orienting (Maruff et al. 1995), and perceptual span (Hardy et al. 2004) suggest the presence of visual attention abnormalities that may increase the risk of negative consequences in daily life (e.g., increase likelihood of automobile accidents; Marcotte et al. 2006). Mental manipulations of objects and concepts have been explored through two recent explorations in asymptomatic HIV participants. Olesen et al. (2007) described mental rotation deficits in a computerized task examining reaction time and errors on mental rotation of hands and 3D objects, in which group differences were observed with increased task difficulty (i.e., greater degree of rotation). More recently, Bogdanova et al. (2008) related errors on mental and physical number line orientation to measures of component processes (e.g., executive functions, visuospatial skills) and noted relative impairment in visuospatial functioning among those with HIV. Although these works support the likelihood that subtle deficits exist in spatial cognition in HIV infection, the underlying etiology is still unclear. Recent neuroimaging research suggests that cortical thinning of parietal and frontal lobes is associated with cognitive impairment (Thompson et al. 2005). Whereas several groups have used significant correlations between target tasks and supplementary measures of spatial cognition to support a possible posterior parietal pathogenesis, the strong reliance on frontostriatal pathways across tasks temper this argument (e.g., hierarchical pattern processing, Olesen et al. 2007; spatial reasoning, Bogdanova et al. 2008). As such, multidisciplinary, thorough investigations of spatial cognition in HIV are still needed to elucidate the nature and origin of impairment. Although language impairments, and particularly expressive language difficulties, are a prominent cognitive feature of HIV infection in children (e.g., Wolters et al. 1997), it has long been held that HIV-infected adults demonstrate broadly unremarkable speech and language functioning. Indeed, aphasia is not typically observed in association with HIV, with the exception of rare instances in which a CNS opportunistic infection (e.g., progressive multifocal leukoencephalopathy) produces a perisylvian lesion (while CNS opportunistic infections have declined in developed nations due to cART, they remain prevalent in resource-limited settings [see Robertson and Heaton 2009]). Despite this widely held belief, we are unaware of any large-scale studies examining the basic aspects of speech and language in HIV infection and must therefore base our impressions on the relatively few case series available in the literature. For example, Lopez et al. (1994) found evidence of a mild motor speech disorder in six patients with HIV that was primarily characterized by ataxic dysarthria (e.g., irregular articulatory rhythm). A more recent case series suggests that subtle vocal abnormalities may also be observed in HIV (e.g., Mathew and Bhat 2008), including reduced volume of speech, shorter phonation duration, and mild vocal tremor (Mathew and Bhat 2007). Despite a relative paucity of empirical evidence, the limited data available indicate that basic receptive (e.g., auditory comprehension) and expressive (e.g., repetition) language functions are generally within normal limits in HIV infection (e.g., McCabe et al. 2007), although mild difficulties in the more complex aspects of expressive language may be observed. If present, general expressive language deficits tend to be mild in the asymptomatic stage of disease, but may increase to medium effect sizes in persons with AIDS (Reger et al. 2002). Despite these subtle difficulties, formal assessment of confrontation naming generally reveals normal performance (cf. Grohman et al. 2002), even among individuals with HAD (e.g., White et al. 1997). Mild impairment in the pragmatic aspects of communication may nevertheless be evident, including turn-taking during conversations (e.g., inappropriate interruptions), poor lexical selection, and reduced fluency (McCabe et al. 2007). Indeed, verbal fluency impairment is the most frequently identified language deficit in HIV and is estimated to occur in approximately 40% of the population (Rippeth et al. 2004). Verbal fluency deficits are generally mild but may increase to moderate severity among individuals with more advanced HIV disease (Iudicello et al. 2007). Regarding the profile of HIV-associated verbal fluency impairment, a recent meta-analysis showed generally comparable effect sizes for both letter- and category-cued fluency tasks (Iudicello et al. 2007), which is consistent with meta-analytic findings in other frontal systems conditions, such as frontal lobe lesions (Henry and Crawford 2004). In fact, prior research shows that HIV-associated verbal fluency deficits correlate with neurodegeneration in frontostriatal systems, including caudate atrophy (Hestad et al. 1993). At the level of component cognitive processes, verbal fluency deficits may arise from several different underlying factors, including bradyphrenia, degraded semantic memory stores, and/or inefficiencies in complex process of switching between lexico-semantic categories during word retrieval (Troyer 2000). Three studies have used Troyer’s (2000) model of clustering (i.e., consecutively generated words within a lexico-semantic category) and switching (i.e., disengaging from a cluster and identifying and accessing another subcategory from which to generate words) to evaluate the hypothesis that HIV-associated fluency deficits may be a function of executive dyscontrol of switching secondary to frontostriatal neurotoxicity. In an HAD sample, Woods et al. (2004a) posited that HIV-associated verbal fluency deficits were specifically driven by impairment in the process of search and retrieval from lexico-semantic memory stores, as indicated by impaired switching and elevated intrusion errors (91% of which occurred in the context of a phonemic switch) in the setting of spared semantic clustering. Indeed, switching impairment was evident even when corrected for overall word production, suggesting that the switching finding was not simply an artifact of cognitive slowing. In a subsequent study, Millikin et al. (2004) reported that the letter and category fluency deficits in patients with AIDS were driven by impairment in switching, rather than clustering. Similarly, Iudicello et al. (2008) observed impairment in category fluency switching, but not clustering, in a sample of largely immunocompetent HIV-infected persons. Category switching deficits were modestly correlated with measures of executive functions, working memory, and semantic memory (i.e., confrontation naming). Interestingly, an interaction was observed such that the HIV-associated verbal fluency switching deficit was exacerbated when an explicit alternating fluency paradigm was used (Iudicello et al. 2008). Taken together, these studies indicate that HIV-associated fluency deficits may be primarily driven by difficulties switching between semantic memory stores during word retrieval (cf. bradyphrenia or a degradation of semantic memory), which may be a function of executive dyscontrol of rule-guided search and retrieval processes secondary to dysregulation of frontostriatal systems. Moreover, the association between switching and measures of semantic memory also suggests that, consistent with current conceptual models of verbal fluency, there may be implications for frontotemporal networks more broadly. Hypothesis-driven neuropathological and neuroimaging (both functional and structural) studies are needed to clarify the neural underpinnings of HIV-associated verbal fluency switching deficits. Perhaps due to their generally mild severity, HIV-associated verbal fluency deficits are only modest predictors of everyday functioning outcomes. A recent series of studies suggests that a relatively novel test of action (verb) fluency (Piatt et al. 1999) may be more severely affected in HIV (e.g., Woods et al 2005a) and may demonstrate superior prediction of functional outcomes (Woods et al. 2006a) as compared to traditional verbal fluency measures that use letter (e.g., FAS) and noun (e.g., animals, supermarket items) retrieval cues. Action fluency (i.e., rapid oral generation of ‘things…that people do’) was developed within the conceptual framework that the neural networks involved in noun and verb processing are singly dissociable (Damasio and Tranel 1993). Specifically, noun generation is posited to rely primarily on temporoparietal networks and semantic memory stores, whereas verb generation places greater demands on frontal systems, executive functions, and motor planning (e.g., Cappa and Perani 2003). Action fluency is disproportionately affected in HIV relative to the standard noun- and letter-based fluency tasks (Cysique et al. 2007; Woods et al. 2005a) and is impaired in approximately 60% of persons with HAND (Woods et al. 2005a). Moreover, HIV-associated deficits in action fluency may be dissociable from those in noun fluency at both the cognitive and neurobiological levels. As compared with noun fluency, action fluency correlates more strongly with measures of motor coordination, executive functions, and working memory in HIV (Woods et al. 2005a). In addition, action fluency, but not noun fluency, correlates with HIV biomarkers of astrocytosis (i.e., elevated S-100β in the CSF), suggesting that the neuropathogenesis of these impairments may be distinct (Iudicello et al. 2008). Of arguably greatest importance, action fluency demonstrates incremental ecological validity versus letter and animal fluency as a predictor of IADL dependence in HIV (Woods et al. 2006a). A recent study showed that action fluency was approximately twice as sensitive to IADL declines versus letter and animal fluency combined; in fact, HIV-infected individuals who are impaired on action fluency were five times more likely to be IADL dependent than those who perform within normal limits (Woods et al. 2006a). It is hypothesized that HIV-associated action fluency deficits reflect inefficiencies engaging motor representations during action retrieval, which may therefore disrupt the generation and organization of the action-based programs needed to function in day-to-day life. Of course, these findings await replication and further research is needed on the cognitive mechanisms (e.g., switching) and neural substrates of action fluency impairment in HIV. Despite effective systemic treatments and improved survival rates, the high prevalence and adverse functional impact of HAND have endured in the cART era and continue to represent a salient public health issue. Over the past 15 years, substantial progress has been made in revealing the cognitive architecture of HAND, the central mechanisms of which appear to revolve primarily around psychomotor slowing and cognitive control over mental operations, possibly reflecting the influence of disrupted frontostriatal circuits on distributed neural networks critical to cognitive functions (e.g., frontotemporal and frontoparietal systems). Considerable work remains to be done in clarifying the cognitive mechanisms of HAND, especially in identifying the components of executive dysfunction (e.g., component processes of planning deficits), which may play a central role in numerous aspects of everyday functioning (e.g., medication adherence). Moreover, surprisingly few studies have taken advantage of the many advances in functional neuroimaging that may illuminate the neural substrates of the cognitive mechanisms of HAND, as well as provide the opportunity to draw upon the rich cognitive neuroscience literature that has yet to be applied to neuroAIDS research. Such efforts may be useful in isolating the individual and combined cognitive effects of common comorbidities, such as substance abuse and aging, both of which may be fertile sources of hypothesis generation (e.g., Hardy & Vance, this issue). Importantly, the cognitive neuropsychology approach, particularly in the areas of memory and language functioning, has already been helpful in improving the ecological relevance of neurocognitive assessments in HIV infection (e.g., Woods et al. 2009). Ultimately, this approach will be most useful when it is designed to inform the development of novel, targeted cognitive and behavioral strategies to lessen the impact of HAND on the day-to-day lives of individuals infected with HIV, as well as their care providers. Indeed, there is a paucity of research on the efficacy of cognitive and behavioral remediations of HAND, which represents a critical direction for future research efforts. Parsons, T. D., Braaten, A. J., Hall, C. D., & Robertson, K. R. (2006). Better quality of life with neuropsychological improvement on HAART. Health and Quality of Life Outcomes, 4, 11. doi: 10.1186/1477-7525-4-11.